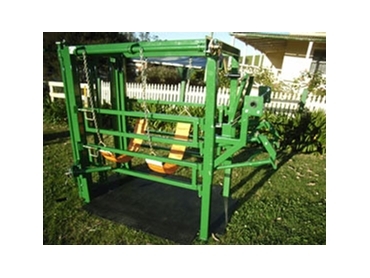 RP Rural Engineering present the RP Hoof Works, a cattle hoof access system designed to lift the legs of dairy cows to give access to the hoof and both sides of the cow. These cattle hoof access systems work by restraining the heads of the cows as they are directed into it. A gate with the rear leg lifter incorporated then closes behind the cows and a leg saddle is attached, allowing one leg to be winched up and back into a cradle. The front leg lifter works in a similar way. The RP Hoof Works herd management system allows easy access to the hoof for safe trimming, cleaning and repair work. farmers a not at risk of being kicked when the cows rear legs are resting in the cradle. With opening and removable side gates, all veterinary work that requires access to the side of the cow is also very simple.